This black and white photograph shows Bishop John F. Cunningham,(1842-1919), copied from the" Biographical History of Cloud County, Kansas" by Mrs. E.F. Hollibaugh. Cunningham a native of Kerry, Ireland, began his spiritual career when he graduated in 1860 from St. Benedict's College in Atchison, Kansas. After theological courses from St. Francis' Seminary in Milwaukee, Wisconsin, he was ordained as a priest on August 8,1865 in Leavenworth, Kansas. As a priest Cunningham became the first Catholic residential pastor of Fort Scott, Kansas from 1865 to 1868. Later in 1868, he transferred to St. John's church in Lawrence, Kansas where he helped parishioners build a new church. For a number of years he ministered throughout Kansas before he became pastor of Assumption church in Topeka, Kansas from 1876 to 1882. Cunningham's spiritual responsibilities to his parishioners and to the Catholic church were further recognized when he became vicar general of the Leavenworth diocese in 1881. The following year he was appointed rector of the Leavenworth cathedral 1882 to 1887. 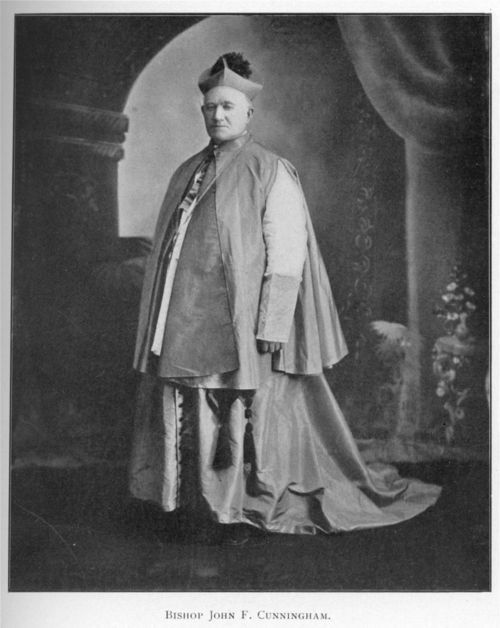 On September 21, 1898 Cunningham became the Bishop of Concordia a position he held until his death on June 23, 1919 at the age of seventy-seven.